NARS Satin Lip Pencil in Palais Royal– I have the Velvet Matte Lip Pencil in the color Dragon Girl and it was my go-to red for a while. I’ve only tried that one color from the line, but I do find the matte pencil a little bit drying. I’ve always wanted to try the Satin version and this deep berry color looks really pretty online. 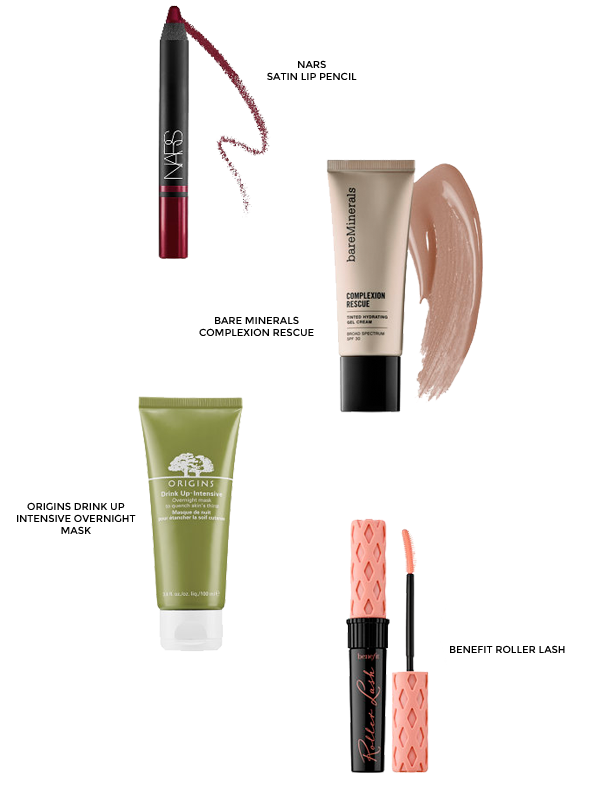 Bare Minerals Complexion Rescue– This has been popping up everywhere lately, so naturally I became curious. I don’t really wear foundation or anything at the moment, but I’ve been thinking about getting a lightweight base for days when I want to look a little more polished. I want something that looks natural and feels like you’re barely wearing anything. I haven’t tried any products from Bare Minerals before, but I’ve heard good things about the brand. Kim also did a review on this recently. When I saw how glowy and great her skin looked, this product moved a few spots up on my wish list. Origins Drink Up Intensive Overnight Mask– For the past couple of weeks, I’ve incorporated a face mask into my weekly Sunday routine. My skin continues to suffer from the winter weather, so I’ve been trying to be better about moisturizing daily. Ashley tweeted about this Origins mask a little while ago and she said it’s been saving her skin. With a rave review like that, I knew I had to add it to the list. Benefit Roller Lash– This is another product that’s all over place- I guess you can tell that I can get sucked into the hype. However, I really like Benefit’s They’re Real and I trust them when it comes to mascara. People are saying that Roller Lash is just as good. Mascara has become the one product I always put on before I’m heading out the door (well, usually that and a bit of eyeliner). So far I’ve mostly dabbled in drugstore mascaras (Maybelline is my go-to brand), but if this is as good as people are saying, I might be willing to splurge. Let me know if you’ve tried any of these products! When I saw this picture, I had immediate hair envy. I wish I could snap my fingers and make my hair look like this! 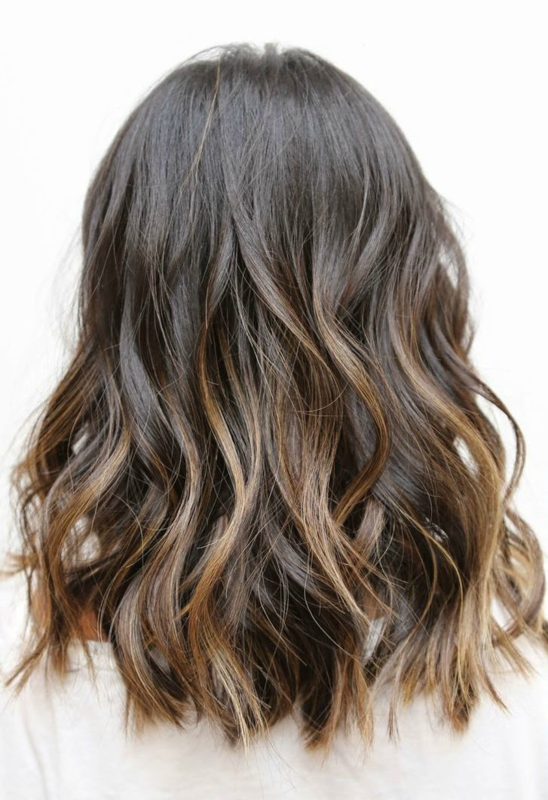 I love a messy tousled look and one day I will figure out how to do this to my own hair. I mentioned that I picked up a curling wand in December and it’s been my secret weapon for making it seem like I actually did something with my hair. I remember when I first started curling my hair (not that long ago) it would take me a good hour to do it. Now with some practice, I’ve been able to reduce that time greatly. With my curling wand, it’s even faster- I can quickly curl just the ends of my hair in about 5-10 minutes. Do you have any tried-and-true methods for curling your hair? Or favorite products to use? You guys always give great advice, so I’d love to hear your thoughts below! 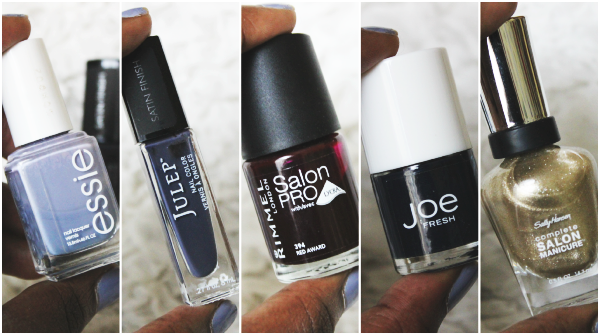 Today I wanted to talk about a few of the nail polishes that I’ve been reaching for lately. In winter, I definitely gravitate towards darker, moody colors. Every once in a while, I’ll break up my dark streak with a lighter color and during the festivities last month I was all about that sparkle. Essie Barefoot in Blue (similar)- This is a nail polish that I won (I think?). 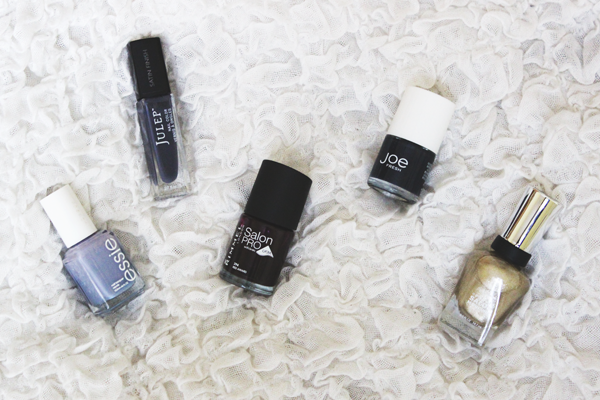 It was created in a collaboration between Essie and TOMS. It’s a dusty cornflower blue and I think it’s a color that looks great in spring or winter. 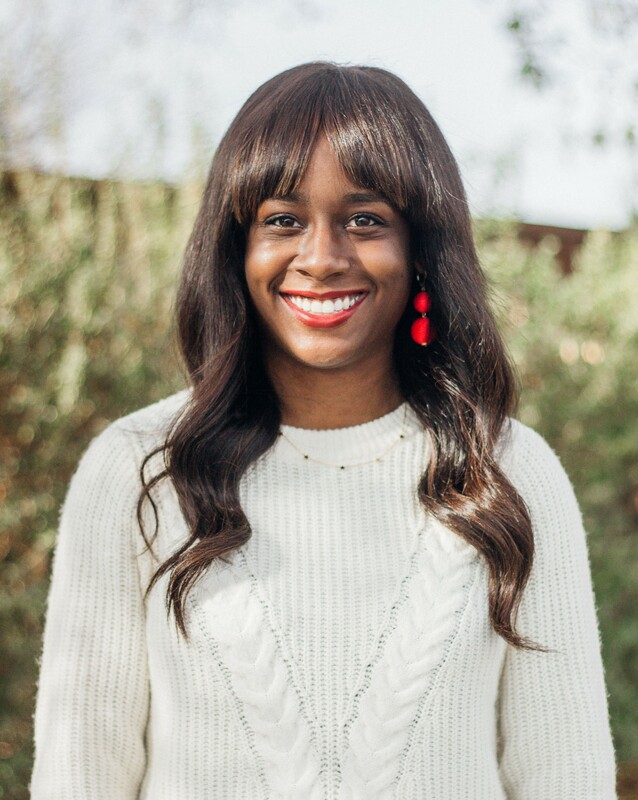 Julep Quinn– When I find a color that’s different from everything else in my collection, I get pretty excited. This is a muted purple-grey nail polish with a satin finish. I don’t think I’ve ever really seen a color like this, so I think this nail polish is very interesting. Rimmel Salon Pro Red Award– I’m still not over these deep reds for fall/winter. I love the formula of this polish and if you want to learn more, you can check out my previous beauty fave post. Joe Fresh Navy (similar)- When I first discovered Joe Fresh a couple of years ago, I was surprised to find out that they also carry some beauty products. Their nail polishes were 3/$10, so of course I had to buy a few and try them out. I think the quality of these is good and I love a good navy blue. Sally Hansen Complete Salon Manicure Wedding Glitters– During the month of December, I pretty much only wore glitter polishes on my nails. For two weeks I used Formula X Wham!, but when I traveled home for Christmas I didn’t take any nail polish with me. I was browsing Walgreens for a hair dryer and I spotted this pretty gold shimmer (Typical. I basically can’t go into the drugstore without buying a nail polish.). It’s eye-catching and also great because it’s contains fine glitter, instead of chunky glitter that’s a pain to remove. 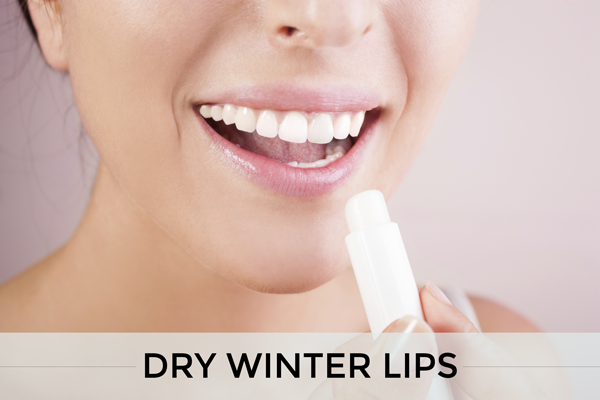 As soon as winter comes around, I feel like it’s a constant battle to keep my lips from getting dry and chapped. Generally, I have dry skin, and that’s only exacerbated during the wintertime. I’ve been using Vaseline on my lips for ages, ever since I was a little kid. Vaseline definitely provides some relief, but I was wondering if you guys had any tips to help with dry winter lips? I’ve heard good things about the Bite Beauty Agave Lip Mask, but do let me know if there are any really great balms you use to keep your lips from getting dry. I’d also love to hear about any lip products that you find particularly moisturizing. Sound off in the comments below!